We want some of designs related Adobe &quot;Photoshop + illustrator&quot;. We want creative and your own productivity, copy paste not allowed. We will check and if we like your work, we will hire you on monthly base or per hour. Which we decide after approval. 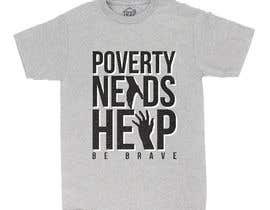 We want Simple T-Shirt design on charity text "Poverty Needs Help. Be Brave" with somthing like poverty related sketch or etc. So please also send us Adobe (Photoshop + illustrator) files. We want to check these files also. We need these designs after approval of T-Shirt, which we will give you after your selection. And gives you more work on monthly base or per hour rate. NOTE: Its just for demo purpose. We will not pay for this T-shirt to every one but if we like someone work then We will pay. please check my entries and let me know if you want any changes..?